IMPACT : At Impact, we set a stage for the children to explore their self-awareness and artistic skills, act out their imagination, fine-tune their communication and social skills. Children will write screenplay and dialogues, Perform Mimes, Mono acting, Dubbing, Design Makeup and Costume,Explore usage of Space usage, Stage design, Props making, Lighting and Sound Effects, Make Trailers, Ads, Publicity and Marketing, Learn about History, different forms of theater and world theater. All this while having frolicking fun. 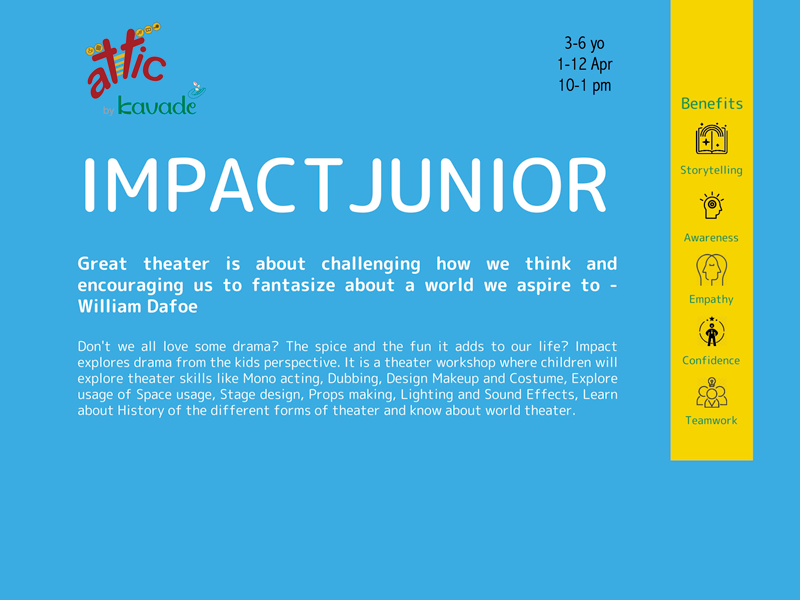 Impact Junior is specifically designed for kids 3-6 years. 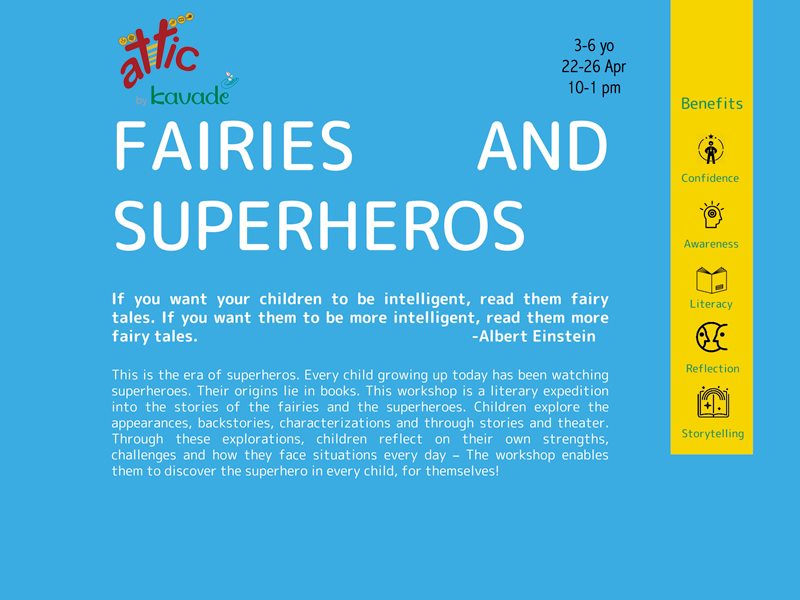 FAIRIES & SUPERHEROES : This workshop is a literary expedition into the stories of fairies and superheroes. It underlines that each child is a fairy or superhero, having both strengths and weaknesses. It is accepting the weaknesses and working on them and not letting them weigh you down that turns a person into a fairy or superhero. Children explore the appearances, backstories, characterizations of fairies like Tinkerbell and superheroes like Batman through card games, drawing, costume making, storytelling, and role plays. 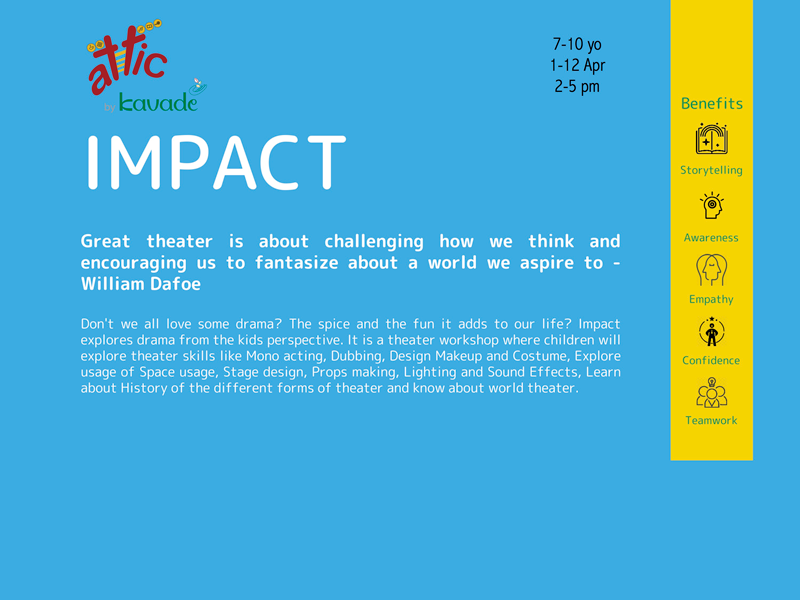 IMPACT : At Impact, we set a stage for the children to explore their self awareness and artistic skills,act out their imagination, fine tune their communication and social skills. Children will write screen play and dialogues, Perform Mimes, Mono acting, Dubbing, Design Makeup and Costume,Explore usage of Space usage, Stage design, Props making, Lighting and Sound Effects, Make Trailers, Ads, Publicity and Marketing, Learn about History, different forms of theater and world theater. All this while having frolicking fun. 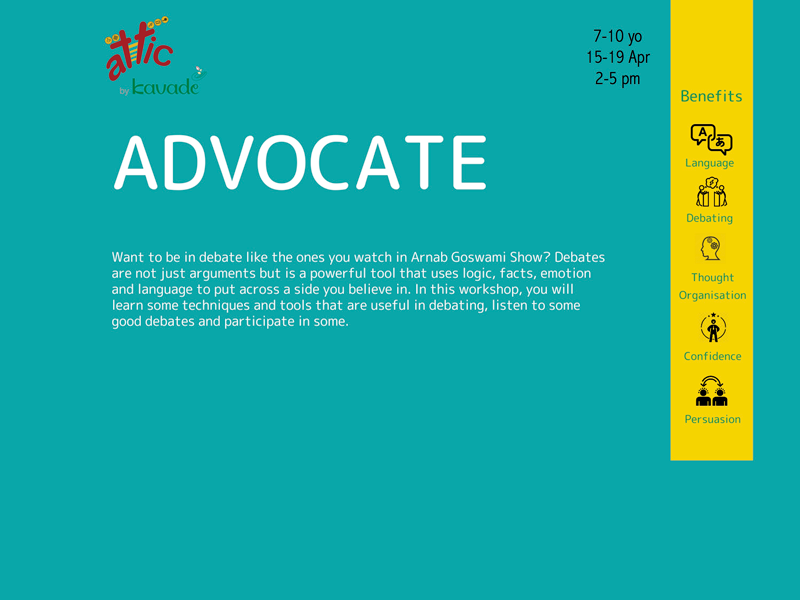 ADVOCATE : Debates are not just arguments but is a powerful tool that uses logic, facts, emotion, and language to put across a side you believe in. In this workshop, the child will learn some techniques and tools that are useful in debating, listen to some good debates and participate in some. 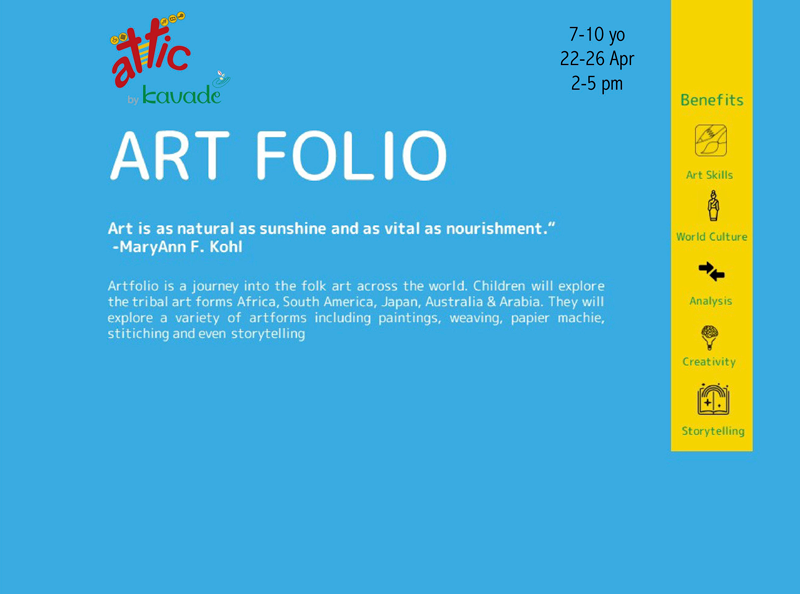 ART FOLIO : Art folio is a journey into folk art across the world. Children will explore the tribal art forms from Africa, Southamerica, Japan, Australia & Arabia. 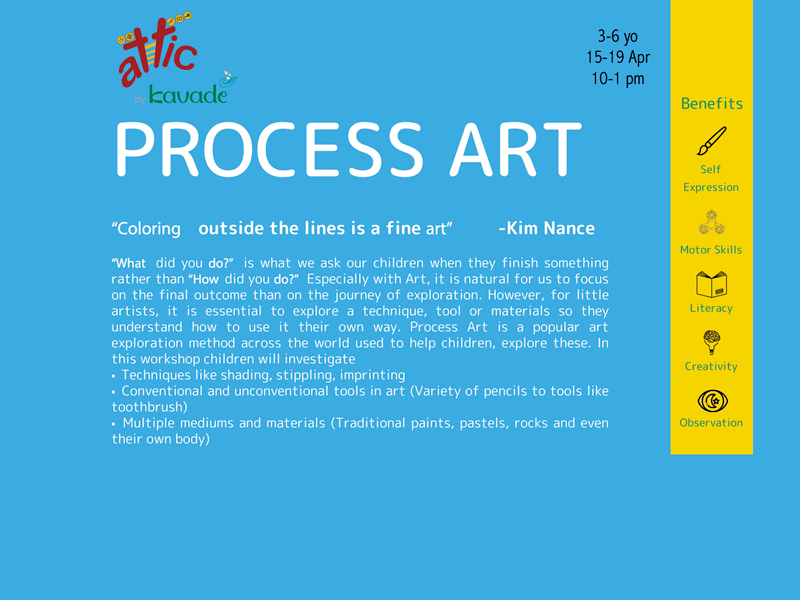 They will explore a variety of artforms including painting, weaving, papier mache, stitching as well as storytelling.